Which was school with Scout troop? PUPILS of the Market Street Church of England School in 1913-14. The headmaster on the left is Mr Henry Colin Barker. FOLLOWING a request from Gareth Robert for a chapter about "early Scouting in Nantwich" for his forthcoming book about Nantwich people and groups (his second), I have been researching the details of the Scout troops that have existed in Nantwich over the years. There was a troop listed as the 13th S. W. Cheshire, 3rd Nantwich (Central School). The Headmaster was H Barker, and the Scoutmaster, Ernest Ankers. I wonder if you know which school was referred to as Central School in the late 1920s - early 1930s. Manor Road? Or maybe somewhere else. I CAN tell you that H. C. Barker was the headmaster at the Nantwich Council School in Manor Road, Nantwich, in the early 1930s. This school was then called the Nantwich Council Modern School and catered for boys and girls of 11 and over. Attached to it was Nantwich Council Primary School which I attended. Oh happy days! I'm sure that this will be your central school. I HAD permission from Janet Gray - widow of the late Robin Gray whose picture it was - to use the photograph (above) of the Market Street Schoolboys that include some Scouts. I thought these must be the earliest Nantwich Scouts but I was wrong. Gerald Newbrook says that he came across a reference to 16 scouts with Scoutmaster Mr Glover from the Nantwich Workhouse camping at Ecclestone, Chester, in August 1911. That’s very interesting as I had no idea that there was a Scout troop at the Barony Workhouse. So these must be the earliest Scouts found so far. The picture was given to me by Robin Gray, whose father is on it. It is the Church of England school in Market Street School (1913-14) and includes the headmaster, Mr Henry Colin Barker, on the left. Joseph Jervis, Leonard Boyer and Herbert Bowker. Arthur Myford later worked at Harvey’s Tannery, along with his elder brother, Harry. Harry Clewlow was the father of the present Harry Clewlow of the butcher’s shop in Pepper Street). William France was the son of John France, a picture framer with a shop at 12 Beam Street (now I Wear opticians). Frank Rackleyeft's father had a furniture shop in High Street (where Bridgfords is now) and which later moved to Pillory Street. Len Boyer was Nantwich Carnival King in 1952 and was a well-known member of Acton Operatic Society. Harry Myford is in the group photo of workmen at Harvey's Tannery. Mr Barker was headmaster at the Market Street School and later at the Manor Road school. FOOTNOTES: Gerald is an expert in Scouting as he is the District Archivist of the South West Cheshire District Scouts Association. The 38th S.W. Cheshire Scouts troop (Nantwich Parish Church) marked the 75th anniversary of its founding in September 2012. What did the Wall Lane cottages look like? HI, Andrew. I grew up in Wall Lane and now live in Crewe. My mother still lives there but doesn't know much of the history of the lane. Wallfields Farm (a farm maybe named because the address was Wall Lane?). Numbers 36-40 used to be timber-framed style dwellings before they were destroyed by fire (around 1936-37) and I believe the houses were the town's last remaining "salt houses" standing that used to house the salt workers. But I don't know how true that one is! salt works on Snow Hill? I've always been fascinated about what the missing houses of Wall Lane (2 to 26) looked like. I believe these were flattened even before the Kwik Save supermarket in Beam Street was thought of and which would have been where the houses would have stood. I can still remember numbers 28 to 30 because those two were knocked down in the early 1980s to make room for Sproston's Builders yard that was. So I was wondering if you knew of any photos of the lost houses of Wall Lane. I found old pictures of the current lane and old pictures of Snow Hill / Cart Lake area, but no pictures of numbers 2 to 26. Andy, I assume that you have seen what I have written about Wall Lane in the "Lost Houses of Nantwich" book (by myself and Robin Gray). I can't really add much more to that. I have not come across any photos of the houses 2 to 26 Wall Lane. It is quite possible that some of the workers in the salt houses on this side of the river could well have lived in the earlier cottages such as the black and white cottages that were at 36 to 40 Wall Lane. As to Wall Lane being a thoroughfare, I think that it was a lane leading to Wallfields Farm from the town but the tannery, of course, would generate traffic (and jobs) after the decline in the salt making. HELLO Andrew. I am trying to find the answer to a question in a quiz and wonder whether you can help. The question is: "Where in Nantwich, before 1975, would you find the Nag's Head? This is a bit of schoolboy humour. The answer is not a million miles from King's Lane and Welshman's Lane." The answer may be cryptic and it is certainly evading me! I even wondered if it was something daft like - on the Nag's body, but that doesn't make sense either! Julia, No problem. The Nag's Head was a public house that stood in Beam street almost opposite the end of Pepper Street and was demolished in the 1960s. However, this is NOT your answer. As it is a bit of schoolboy humour, and with the references to Welshman's Lane and King's Lane, it is referring to NAGS or Nantwich and Acton Grammar School and the head would be the headmaster. So the answer is: "The Headmaster's office at Nantwich and Acton Grammar School". The school is, of course, now called Malbank School. "Thank you Andrew! Of course! Have never been good with cryptic clues! That is great, fingers crossed we get the other answers right." Wasn't 'The Potting Shed' just one bar? I'M catching up with Dabbers' news on a rather cold, wet da here in southern Ontario and noticed the story on Ye Olde Vaults pub in which it said that it was always known as The Potting Shed. Is this correct? itself was always referred to as The Vaults. Is a faulty memory at play or am I right in making the distinction? building to be nicknamed "The Potting Shed." The "alleyway" you refer to is - as you will recall - Castle Street. The cinema is now Gregory's Nightclub. John Brough, who runs "A Dabber's Nantwich" website, thought the whole of the pub was "The Potting Shed", but he met someone the other day who said it was just one room off Castle Street, at the rear of the pub. I'M hoping you can help me in obtaining information regarding the Lingard Arms (above). This photograph shows it was a licensed retailer of wines, spirits, ale, porter and tobacco and one sign advertises "Clarion Cycling Club. Good stabling and loose boxes." On the back of the photo it says Beam Street - but that's all. The photo was taken early in the 1900s, when the proprietor was my great uncle, Walter Robinson. (See below). My son is heading to Nantwich in the near future. I've given him our family history and a number of 1800-1900s addresses for him to track down. It's been many, many years since I've been back to Nantwich but next year I'll be there. In the meantime, although he's never been to Nantwich, my son tells everyone he's going "home". Gilda, I'm very pleased to be able to help you with information on the Lingard Arms. I know exactly where it was in Beam Street - on the corner of Manor Road. I remember the building well as Enoch Moulton's the greengrocer. The two photos (top right) of the premises were taken when it was under the ownership of Enoch Moulton. The one below shows the shop decorated and thought to be celebrating the Coronation of King George VI in 1937. There is information regarding the public house in the booklet by Dr A.J.MacGregor called " Inns and Innkeepers of Nantwich." The address was 9 Beam Street, and it was originally an alehouse in 1792 called the Red Cow. In 1830 it was known as the Old Red Cow to distinguish it from the new one which was further down the street, the proprietor having taken the name with him when he moved to the new premises. The "new" Red Cow is still a public house in Beam Street. In 1881, the "old" Red Cow changed its name to the Lingard Arms, and the owners of the premises in 1891 and 1903 were the Crescent Brewery Co., of Burton on Trent. The landlord from 1892 to 1896 was Walter Robinson. That should help to date your photograph. A few years later, Manor Road was built alongside the building. To quote from my book: "In 1913 it had become Blackburn's Cycle Stores and a year later it was the premises of Enoch Moulton, greengrocer, fruiterer and florist. This continued in existence until the building was demolished c1959 along with the Nag's Head next door." Modern shops now stand on the same site but set back further from the pavement than previously. See the foot of this item. On a personal note, Andrew told Gilda: "WHAT a terrific picture of the Lingard Arms. I was delighted with it. It's good to compare it with my two photos of the same building. "It's poignant to me because from 1955 to 1959 I used to cycle into Nantwich and leave my bicycle (unlocked in those days!) in the archway, walk up Pepper Street to the Square and catch the 7.50am bus to go to school. Those were the days!" A comment from Andrew about the date of Gilda's photograph led to a change of thought by her. She wrote back: "With you dating the photo properly, you have cleared up another mystery. My grandmother always said the couple with the dog were my great grandfather, Walter, and great-grandmother, Ellen. With thinking it was around 1910, I took it to be my great uncle. I know now it was my great grandfather." Gilda added: "We are also looking for information about Heap's Clothing Factory. My great, great grandfather James Heap, who died in 1907, was the owner at one time and by the looks of the family history he employed most of the family on both sides at one time or another." This property, now called Taylor's View, was once Heap's clothing factory on the corner of James Hall Street (left) and Arnold Street. 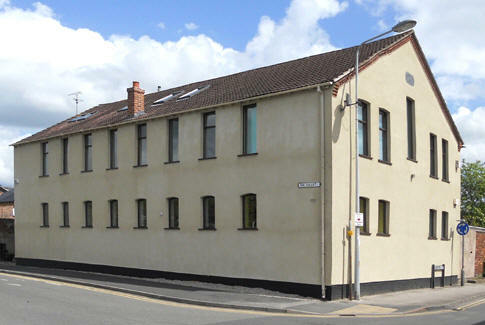 Above, this short length of James Hall Street was known as Heap Street while the building was a factory - or a warehouse to the factory. Andrew told Gilda: "As you know, I met your son when he came to Nantwich and showed him two of the Joseph Heap factories. "The one on the corner of James Hall Street and Arnold Street (above) had moved to that location by about 1910. "The first factory, as far as I know, was the Globe Works dated 1893 on the corner of The Gullet and Hospital Street (right). "Heaps moved in the 1970s to their last site between Crewe Road and Millstone Lane on what is now called Whitewell Close." 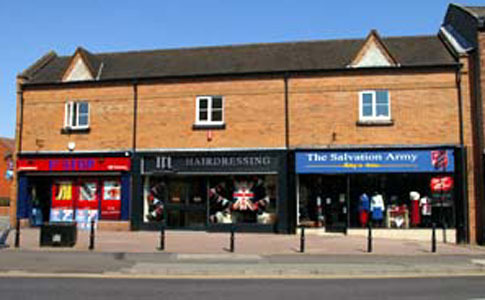 THE row of shops (left) is how the Lingard Arms site looks today with, left to right, 1st Stop off licence and convenience store, TPL Hairdressing and the Salvation Army charity shop.